Quiet long-lasting runner. The Aspire E5-521 can boast with a low operating noise and very long battery life. The laptop also has plenty of storage capacity. Its only real shortcoming is the dark, low-contrast screen. 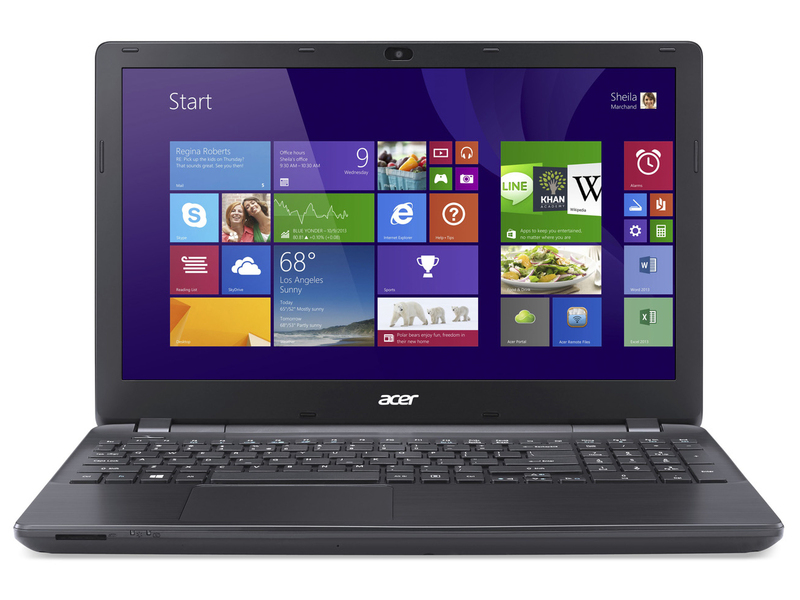 Acer presents yet another affordable, 15.6-inch office laptop with its Aspire E5-521-60Y6. The laptop is powered by an AMD Beema APU. Regular readers of our website will recognize the laptop because we have tested various sister models (Aspire E5-571G, Aspire E5-551) of the Aspire. Our E5-521 review sample will show whether it is compelling. The Aspire has plenty of rivals. Affordable laptops are a dime-a-dozen nowadays. We would mention the Toshiba Satellite L50D-B-12Z, HP 355 G2, and Lenovo IdeaPad Z50-75 as examples. Since the Aspire E5-521's build is identical with its sister models, we will not go in-depth about casing, connectivity, input devices or speakers. The corresponding information can be found in the review of the Aspire E5-551 and Aspire E5-571G. Acer installs a matte 15.6-inch screen with a native resolution of 1366x768 pixels in the Aspire. Unfortunately, the screen only achieves a very low brightness of 173.9 cd/m². This rate is no longer contemporary even in the low-cost sector. We expect a rate that is clearly beyond 200 cd/m². The screen's contrast of 289:1 is also poor. The screen's color reproduction in state of delivery is slightly better than we know from the low-cost sector. The average DeltaE 2000 shift is 8.84. We normally ascertain rates ranging from 10 to 12. A value less than 3 would be desirable. The screen has a minor bluish cast. Acer treats the Aspire to a TN screen. That means that the screen can only offer limited viewing angles. Although it is quite possible to use the laptop outdoors, it will have to primarily be in (very) shaded surroundings. The sun would otherwise outshine the relatively dark screen. Acer's Aspire E5-521-60Y6 belongs to the basic, 15.6-inch office laptops. Applications from the office and Internet fields are no challenge for the laptop. Our review sample is available for just below 400 Euros (~$434). Acer has various other configurations in its lineup. An A6-6310 (Beema) APU from AMD powers the Aspire inside. The CPU part of the APU is a quad-core processor that clocks with a base speed of 1.8 GHz. Its speed can be boosted up to 2.4 GHz via Turbo. The processor performed the Cinebench CPU benchmarks with 2 GHz (multi-thread) and 2 to 2.4 GHz (single-thread). It clocked with 1.6 to 1.8 GHz (multi-thread) and 2 to 2.4 GHz (single-thread) in battery mode. A look in our comparison chart reveals that the CPU's multi-thread performance is just marginally below that of a Core i3-4010U processor. The difference is bigger in single-thread performance. The system ran smoothly and we did not experience any problems. The PCMark benchmark scores are good and are on par with the results of a comparable laptop, such as the Satellite L50D-B-12Z. Replacing the hard drive with a solid state drive can increase the system performance of both laptops. A hard drive from Western Digital is in the Aspire. It has a capacity of 1 TB and spins with 5400 revolutions per minute. The drive's transfer rates are on the usual level for a 5400 rpm drive. The Radeon R4 (Beema) graphics core from AMD is responsible for video output. It supports DirectX 11.2 and clocks with speeds of up to 800 MHz. The 3DMark benchmark scores are as expected. They are on par with those of the Satellite L50D-B-12Z that features the same APU. The Radeon GPU's performance is located between Intel's HD Graphics 4200 and HD Graphics 4400 graphics cores. Installing a second working memory module does not lead to a higher graphics performance in either the Aspire or Satellite. The memory controllers of both laptops do not support dual-channel mode and only run in single-channel mode. The APU installed in the Aspire can smoothly render some games in a low resolution and low quality settings. That, however, only involves games that have a low hardware requirement, such as Dirt 3. An up-to-date game like Evolve is not playable since it needs considerably higher-performance hardware. Positive: The Aspire belongs to the very quiet laptops. The fan is usually off in idle mode, and only the hard drive's noise is audible. Replacing the hard drive with a solid state drive would ensure silence. However, the fan is barely heard during load; we measured a noise level of 34.4 dB in the stress test (Prime95 and Furmark run for at least one hour) - some laptops do not even manage that rate when idling. The Aspire performed the stress test (Prime95 and Furmark run for at least one hour) in AC and battery modes in different ways. The graphics core clocked with 800 MHz and the processor with 1.4 GHz in AC mode. In battery mode, the GPU operated with 400 MHz while the APU started the test with 1.4 GHz but throttled in the course of the test. The Aspire barely heated up during the stress test. 40 °C was only surpassed at one measuring point on the underside (vent area). (+) The average temperature for the upper side under maximal load is 28.2 °C / 83 F, compared to the average of 29.4 °C / 85 F for the devices in the class Office. (-) The average temperature of the palmrest area of similar devices was 28.2 °C / 82.8 F (-2.3 °C / -4.1 F). The idle power consumption is clearly below 10 watts. 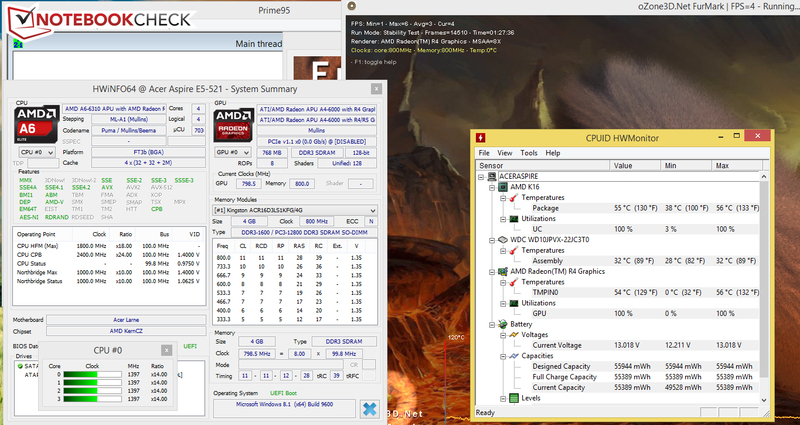 The Aspire did not consume much power during the stress test (Prime95 and Furmark run for at least one hour), either. We measured a rate of 23.7 watts. This rate is owed to the fact that the CPU clocked with a throttled speed in the stress test. Websites are opened automatically every 40 seconds in the real-life Wi-Fi test. The energy-saving profile is enabled, and the screen's brightness is set to approximately 150 cd/m². The Aspire achieved a runtime of 7:07 hours here - a very good rate. Buyers looking for an affordable 15.6-inch office laptop will not make a big mistake with the Aspire E5-521-60Y6. The laptop provides enough computing power for routine. At the same time, it barely heats up and is always quiet, and it also sports decent input devices and a very good battery life. The owner will not be wanting extra storage capacity very soon owing to the 1 TB hard drive. Not to be disregarded: Acer includes a two-year warranty, which is not a matter of course in the low-cost sector. Unfortunately, Acer shoots itself in the foot with the installed screen and prevents a better rating with that. It can only offer a very low brightness and low contrast. At least it is a model with a matte surface. We recently tested Toshiba's Satellite L50D-B-12Z, which is a contender that sports the same APU as the Aspire. We would always prefer the Aspire over the Satellite. It has more to offer in total: The Aspire is 30 to 40 Euros (~$32 to ~$43) cheaper than the Satellite, has a larger hard drive, offers longer battery runtimes, features a matte screen, and it includes a two-year warranty. 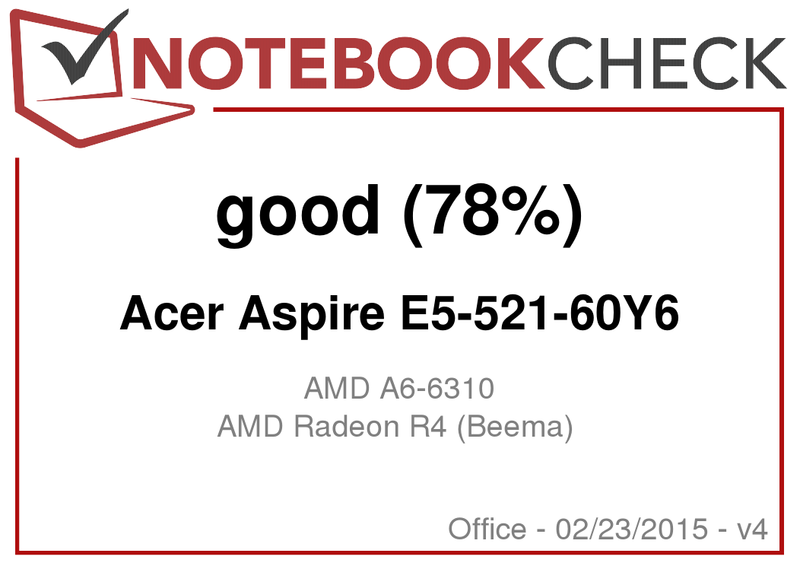 In review: Acer Aspire E5-521-60Y6. Test model courtesy of AMD. The long battery life and low noise development. 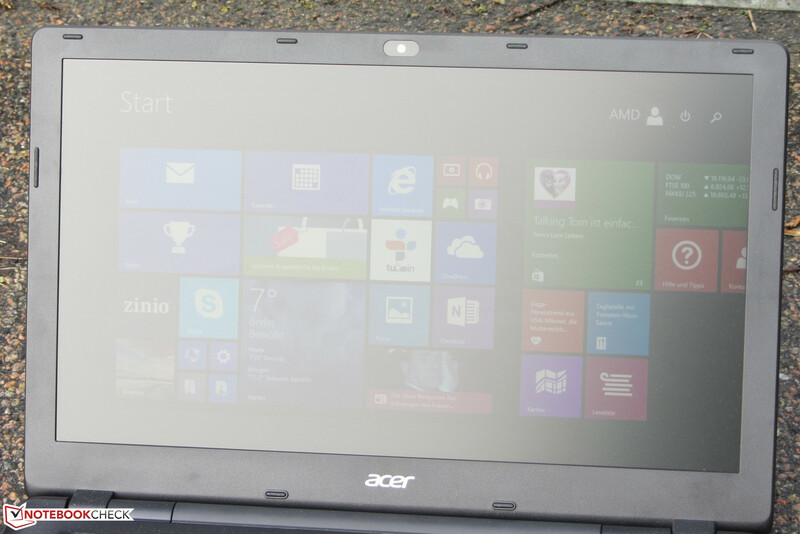 It is beyond comprehension how Acer came up with the idea of installing such a dark and low-contrast screen. Toshiba Satellite L50D-B-12Z, HP 355 G2, Asus X555LD, Lenovo IdeaPad Z50-75, Acer Aspire E5-551G-F1EW, Lenovo IdeaPad G50-70, HP 350 G1, Acer Aspire E1-572G.